Quality Nordic Walking Poles from WWW.SKIWALKING.COM and the American Nordic Walking System have been donated to Wounded Warrior Programs at Walter Reed, Fort Lewis/Madigan/McChord, San Diego, Fort Carson, Vicenza in Italy and Kaiserslautern Military Community in Germany. 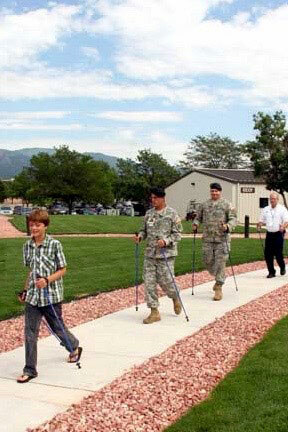 Edwards has hosted Nordic Walking Classes at Fort Carson. 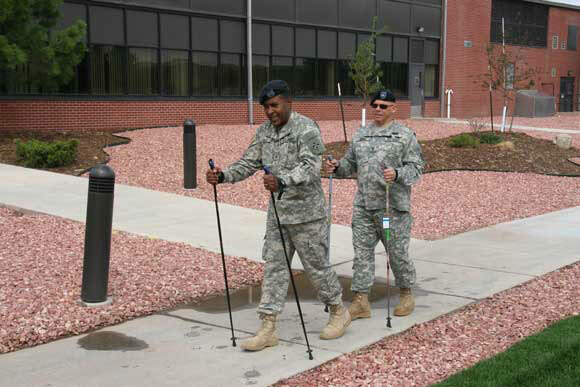 Many of the soldiers attending Edwards’ free Nordic Walking Classes at Fort Carson in Colorado came with canes and/or walkers. One of the soldiers had just been released from his wheelchair. 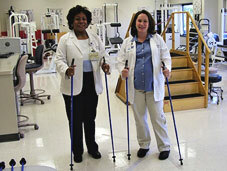 All found much-improved balance, stability, gait, walking posture and walking comfort. These #1 rated Nordic Walking Poles are ideal for fitness walking, hiking, trekking, backpacking, walking in the city, running, on the beach, up on the sand dunes, for seniors, in physical therapy, …….. These quality one-piece poles are tough enough for athletes and prove to be safer and much more user-friendly than collapsible poles for individuals with balance issues. Collapsible poles come with cheap/flimsy twist-locks and/or flip-locks and should never be sold to seniors or individuals with balance issues.